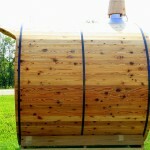 While not Amish built, the quality on our Barrel Saunas is outstanding. 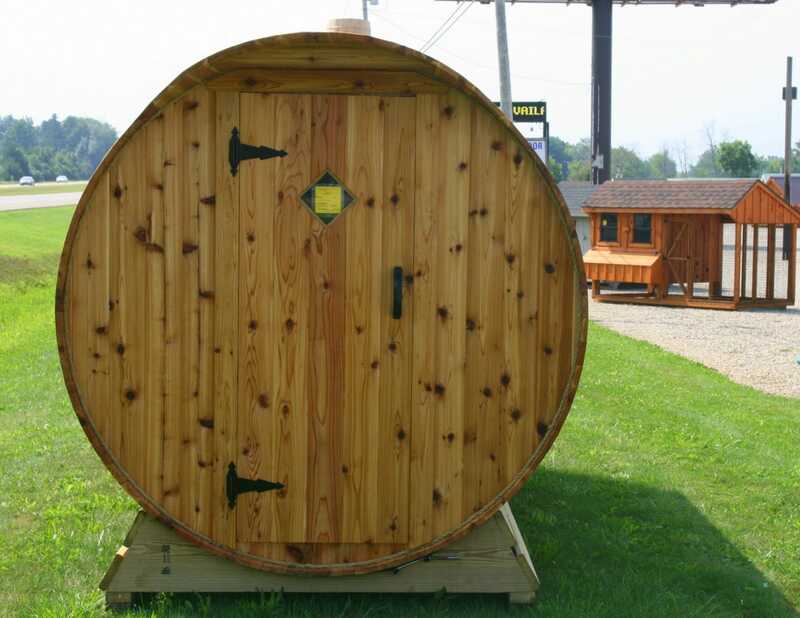 Enjoy the peaceful atmosphere of a warm, barrel sauna. 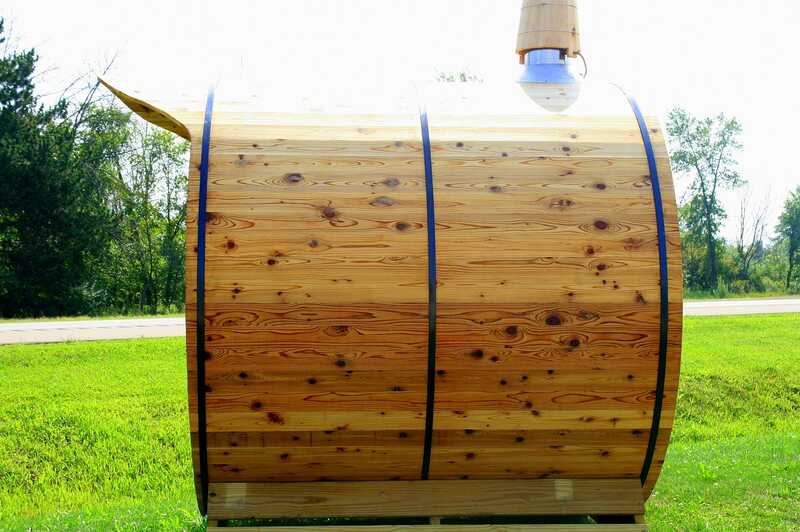 ​​These cozy barrel saunas heat up in 20-30 minutes. 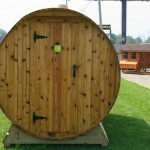 All Barrel saunas come with cradles, floor drain, benches, wood burning stoves and rocks. 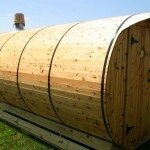 ​Portable when placed on a trailer, pontoon boat or dock. ​Perfect for all seasons: deer camp, polar plunges & summer fun. Optional water jacket & over hangs are available. 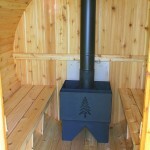 ​The wood burning stove is filled & fired from the outside to eliminate the inside mess. ​​We do offer an electric option for indoor & non-wood burning applications. 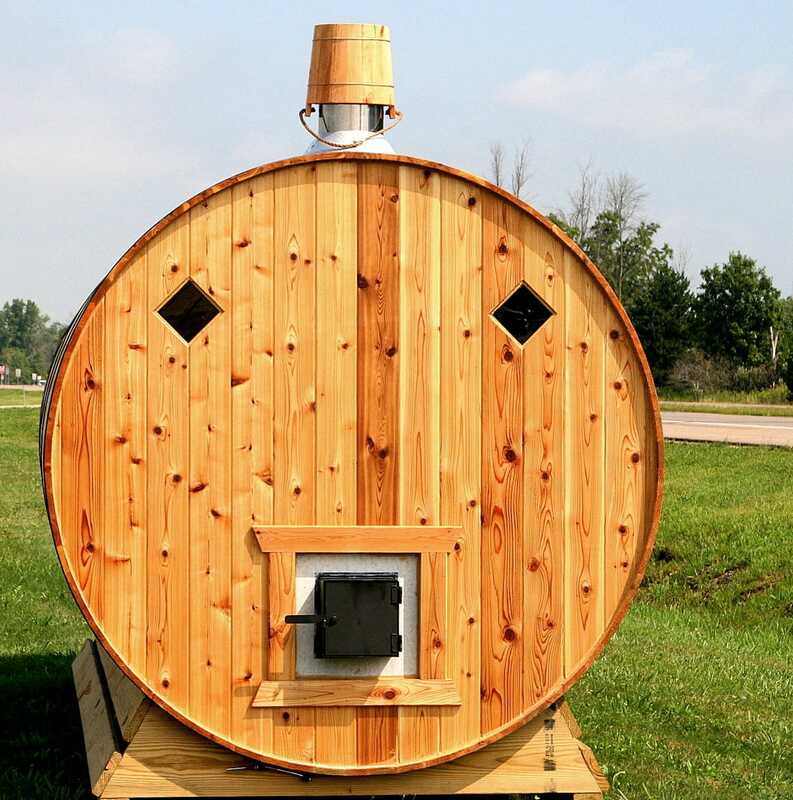 I thought I would take a few minutes this morning to share out with you how we are enjoying our sauna purchased from you. First off, we find it to be very attractive and it fits nicely into our setting. 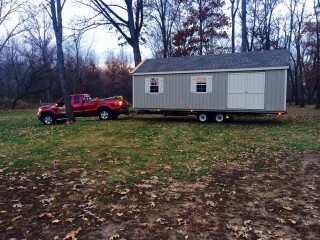 One neighbor thought that it was a smoke house as my husband is an avid hunter and fisherman. We find that it takes about 35 minutes to heat up and if we add a small split log or two it can stay hot for a couple more hours. After each sauna, once cool, we do put a bucket on top of the chimney just to keep the fire area dry. We also set the new fire ready so when one is in the mood for the sauna they just strike a match. We purchased a grabber from Home Depot to be able to lift the bucket over our heads to the chimney top. 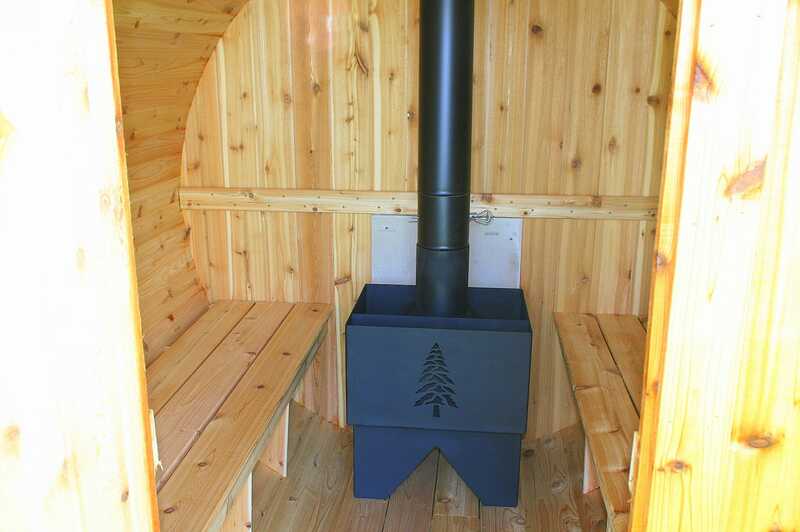 It is pretty inside, plenty of space with the changing room and we enjoy the smell of the cedar. A concern we had was neighbors looking into the cute as can be windows but once it is hot in there, they steam up and no one can see in. We did purchase 4 battery clicking LED lights about 3 inches in diameter that we take out into the sauna when it is dark out. 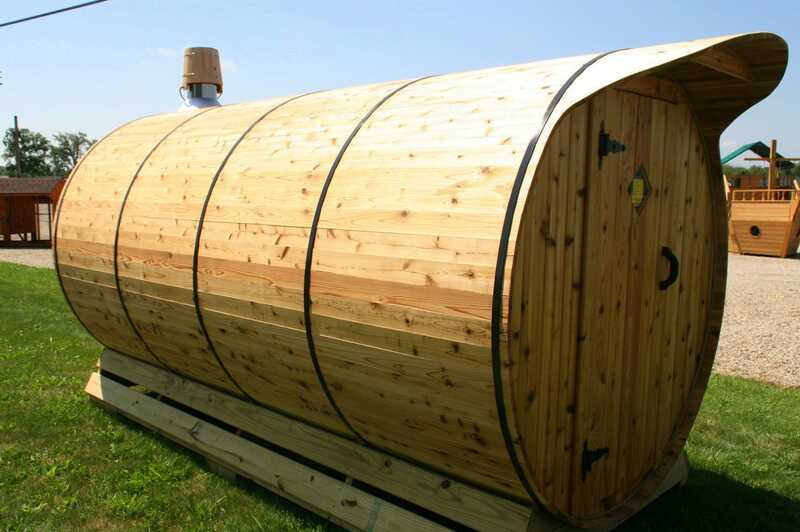 Two of them are in the changing room, two are in the sauna and they can be carried to light the path to the sauna when it is dark. There is plenty of room in the changing room and we even keep our box of kindling wood, papers and matches all in a USA Mail Tub. 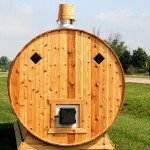 It is easy to sit outside the sauna door if we need room for others. We have put two hooks inside the changing room to the right and left of the main entrance door so that we can hang our clothes on the hooks. We also put two hooks to the left and right of the sauna door entrance for our towels. My husband and I leave our towels out for the week and they dry nicely. We take two buckets of water to the sauna with us, one filled with hot water and one filled with cold water. The cold water is for dipping water onto the fire area. The hot water is for washing. Soaps, etc. can all be left in the changing area. 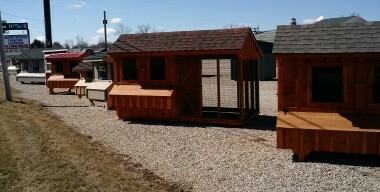 So I would not sell the buckets unless customers know they do not hold water. We did buy igneous rocks on line. One suggestion would be to include the rocks in the delivery and charge the customer. So that is our letter about the sauna enjoyed by our family from ages 2 to age 81.